Photo by Emily Matthews | Boardman’s Jack Ericson throws to first during the Little League 12-U district championship game against Poland last Thursday. Ericson and his teammates will next play in the state tournament this weekend. Jack Ericson threw a 65-pitch simulated game during the Boardman 12-U baseball team’s practice at Fields of Dreams on Tuesday. Ericson, a New York Yankees fan and a shortstop, wore a Derek Jeter shirt but looked more like a right-handed Randy Johnson while on the mound. The 12-year-old is the tallest Boardman player and struck out several of his teammates as the team prepared for the state tournament in North Canton. 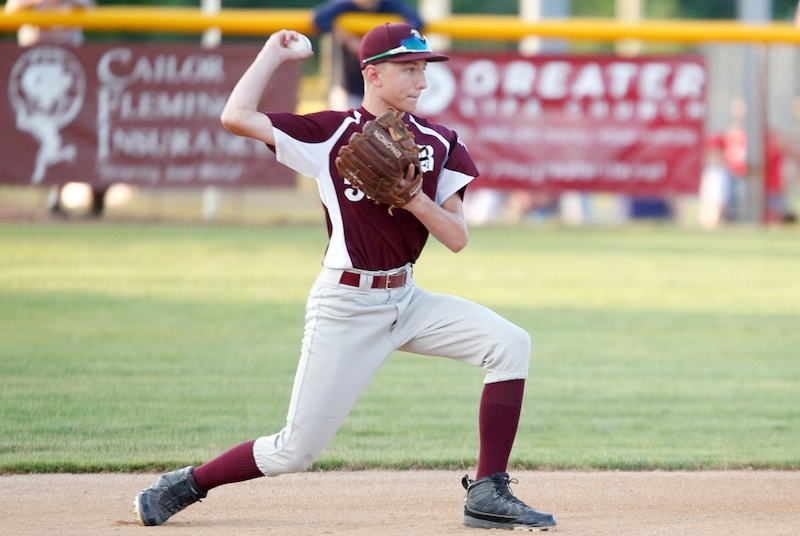 The 12-year-old pitched Boardman to a 7-2 win in the first of two wins over Poland in the District 2 championship. For Boardman’s players, it’s a third chance at a state title — qualifying for the 10-U and 11-U tournaments over the last two seasons. Boardman will have a bye on the first day of the state tournament and will play the winner Galion and West Side in the second round. Boardman (9-1) was undefeated in the Chuck Schafer Tournament, and a 4-2 loss to Howland in the first round of the District 2 tournament was its only blemish during its title run. Boardman claimed the district championship with a 2-0 victory over Poland on Friday. “It feels good. We already made it to state twice. Third time’s going to be great too,” outfielder Marty Stachowicz said. Stachowicz said the state tournament gives the players a chance to show their skills and compete against tougher competition. And having previous state appearances under their belts doesn’t hurt. “We already know what we’re doing so it’s going to feel like we have an advantage over them,” Stachowicz said. Ericson and Stachowicz were two members of the 9-11 Boardman team which beat New Albany 14-7 to win the state tournament last year. Ericson said the team’s goal was to win the district so they can have another shot at a state title. “We knew we had a tough district this year,” Ericson said. “We proved ourselves the two years before so we know what it’s like.